Spray 5-quart slow cooker with cooking spray. 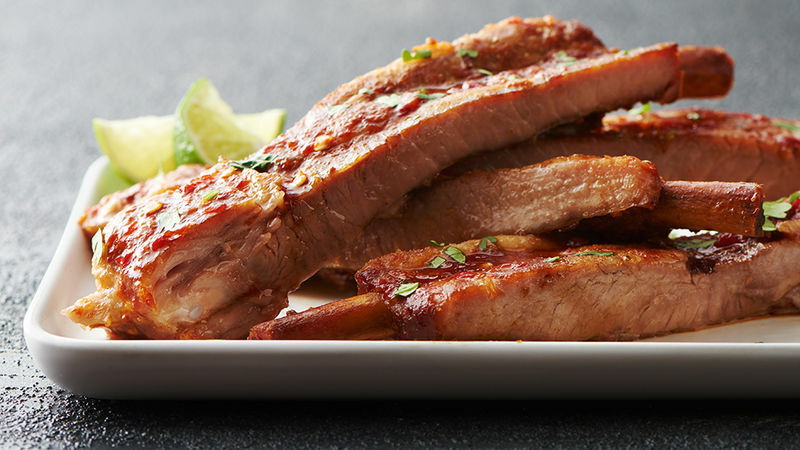 Add ribs to slow cooker. In medium bowl, mix honey, soy sauce, tomato paste, chile garlic sauce and salt. Pour over ribs, and toss to coat. Stand ribs against sides of slow cooker for even cooking. Cover; cook on Low heat setting 7 to 8 hours or until ribs are tender. Transfer ribs to cutting board; let stand about 5 minutes or until cool enough to handle. Cut half racks into individual ribs. Spoon extra sauce over ribs. Top with cilantro, and serve with lime wedges. Removing the membrane from the underside of the ribs will ensure that all that yummy sauce makes it to the meat instead of getting trapped outside the silverskin. To remove the membrane, lift at one edge with the tip of a paring knife, then use a paper towel to grab the membrane and pull it away from the meat in one forceful tug. Like it hot? Serve with extra chile garlic sauce.